Hanzhen was diagnosed with autism at age 2. He is 19 years old now and attends a mainstream international school with normal peers. Hanzhen loves to sketch. To date, he had participated in 42 exhibitions in various locations around Johor Bahru, Melaka, Kuala Lumpur, Kuching, Singapore, Tokyo, Tottori, Kagoshima, Incheon, Seoul, Wuhan and Shanghai. 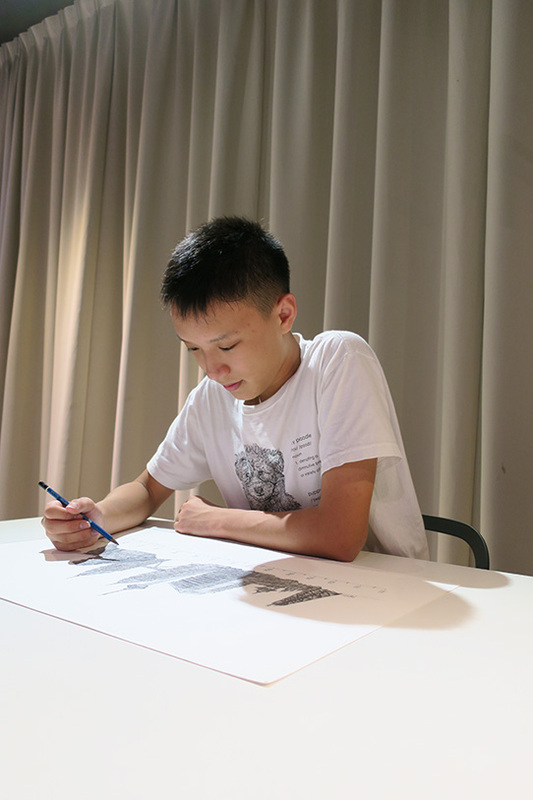 His sketch of the historical Cheng Hoon Teng Temple in Melaka was one of the winning entries in the Asia ParaArt Tokyo 2013 competition, which earned him a spot in a travelling exhibition to various airport locations in Japan together with other Asian artists. In 2014, Hanzhen completed an extensive art installation at the new DoubleTree by Hilton Hotel in Johor Bahru and an art commission for the Consul-General of Singapore. In May 2015, Hanzhen led more than 1000 walkers thorugh the historical town of Melaka during an annual autism awareness event organised by Persatuan Kanner Melaka and sponsored by the Melaka Tourism Board. Later in October 2015, Hanzhen was again invited to lead a public walk to raise awareness in autism in Johor Bahru entitled “Walk For Hope”. Hanzhen started off the year 2016 with the completion of his drawing for the High Commission of the Republic of Singapore in Kuala Lumpur. In April 2016, Hanzhen published a new book entitled “Kuching - Legacy of the White Rajahs” which is a project initiated and supported by the Malaysian Institute of Architects, Sarawak Chapter. This was followed by a major art commission from Shell Malaysia to do two murals for their 125th anniversary. “Celebrating 125 Years Through Art” is an art project involving 8 artists and 15 murals at selected Shell stations nationwide. Multi-talented, Hanzhen also loves to play the piano. He has recently obtained his ABRSM Grade 8 in piano. He had also received the Excellence Performance Award with The Cornerstone at the AnAn International Musical Talent Gala held in Hong Kong. The year 2017 will also see the sneak preview of an art film, a story about the beautiful moments in the life of three autistic artists from different countries in Asia, which will feature Hanzhen as one of the main actors! Hanzhen has published five sketch books in a series called “Sketches By Hanzhen”, currently available in MPH and all leading bookstores in Malaysia and Singapore.